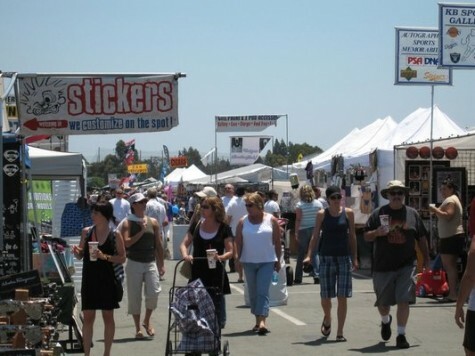 OC is home to the best swap meet ever; the Orange County Market Place offers 20 acres of great values and quality merchandise. If you haven’t been in a while, you will be pleasantly surprised by the more than 1,000 vendors you can shop from every Saturday and Sunday 7 a.m. to 4 p.m. Owner Jeff Teller, one of the nicest men we’ve ever met, says he sees the OC Market Place as a way to give life to entrepreneurial businesses. And we love that. The OC Market Place is really a smorgasbord of cool stuff that you wouldn’t find anywhere else. Here are a few tips. First of all, come hungry. You can find some of the world’s best homemade churros and taquitos at Carlo’s Cantina, as well as homemade tortilla chips (who does that?). Not to just focus on food, but OC Market Place also offers Sinfully Sweet Apple Company gourmet candy apples like you’ve never eaten before, our favorite Chip-N-Dough Cookie Co. cookie dough; addicting Rusty’s handmade potato chips; hummus and pita bread from Baba Foods; dips, olives, tapenade, cheese spreads from GreekMama.com, Bob’s Old Fashioned Ice Cream; organic produce and much more. We could go on and on about the merchandise available, here’s a synopsis: You can buy furniture, bicycles, overstock deals on top name brand merchandise, Costco returns at 50% off retail value, luxury used cars, 1,000-thread count sheets, salon-grade shampoos, beautiful succulents and cacti at incredible prices, and custom engraved pet ID tags. You can even order a state-of-the-art home theater, get a haircut, or buy a prefab home. There’s also an artisans’ and crafters’ corner, and fun activities for the kids. Admission is all of $2, children below age 12 and free. Open Saturday and Sunday from 7 a.m. to 4 p.m. Orange County Market Place, at the O.C. Fair & Event Center, 88 Fair Drive in Costa Mesa. 949.723.6616. Here’s a fun and OC glamorous way to watch Sunday’s Oscars—at Kimera Restaurant’s second annual Oscar Viewing Party, a red carpet style party with a special silent auction benefiting the American Red Cross. Guests will receive the complete movie star treatment, including a red carpet entrance, and a panel of fashion experts will present to award prizes in various categories such as the best-dressed guest. As a special for Greer’s OC subscribers, when you call for reservations just mention Greer’s OC and pay $69 per person, all inclusive! (That’s a savings of $20 per person.) The event begins at 5 p.m. with admittance for ages 21 and over only. Guests will enjoy hors d’oeuvres, a buffet dinner, dessert, a champagne split and a special gift bag. Kimera Restaurant is next to the Google building at 19530 Jamboree Road in Irvine. 949.261.1222.